The largest state park in Florida is the Fakahatchee Strand Preserve State Park. There are a variety of animal and plant species here that are not found anywhere else in the continental United States. The natural attributes of the park have been preserved enabling you to fully enjoy the outdoor activities and facilities. You even have the freedom to explore the wilderness and enjoy the beauty of nature. The park can easily be divided into four main areas. These are the Janes Memorial Scenic Drive, the Jones Grade Lakes, the East River and the Big Cypress Bend Boardwalk. The Big Cypress Bend Boardwalk is classified as a notable natural landmark with a beautiful stand of virgin cypress. 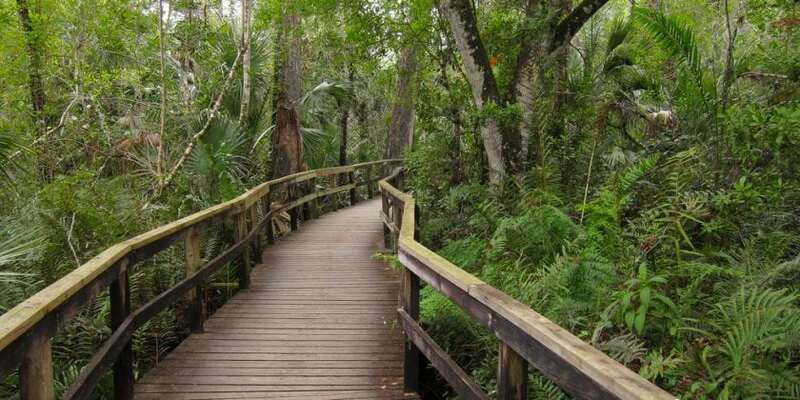 The Boardwalk is approximately 2,500 feet in length and winds throughout a pristine and lovely area of the Fakahatchee Strand swamp. The end of this area is at the alligator pond and charming observation deck. This is an excellent opportunity for you to become more familiar with the preserve and offers a great short hike. The boardwalk is right off U.S. 41 west of State Road 20. The East river is a tidal responsive creek of mainly brackish waters. The creek flows southwest to the Ten Thousand Islands and Fakahatchee Bay. This creek is both varied and beautiful as it runs through a succession of canopied mangrove tunnels and small lakes before it widens and transforms into a tidal river. To help you find your way, the park visitor center and launch will be happy to provide you with maps of the rivers. You do not want to miss the Jones Grade trail and lakes off State Road 29. These lakes are excellent for your choice of fishing, kayaking and canoeing. It is important to note swimming is not allowed. The Jones Grande Trail connects to the Florida trail, the Pennington Post trail and the East Main tram through the strand swamp. You may want to consider RV camping as an excellent way to spend some time exploring this sensational park. The main point of access to most of the biking trails and hiking in the park is Janes Memorial Scenic Drive. This dirt road extends for eleven miles from Copeland’s visitor center to the border of Fakahatchee along the Picayune Strand State Forest. Every trail located within the park is a cleared tram road. These trails were created from the 1940’s throughout the 1960’s when the land was originally logged and are an important part of the area history. The West and East Main trams are the most popular trails for hiking. The West Main tram is just four miles from the visitors center. This trail will take you through a couple miles of strand swamp prior to opening into a gorgeous marle prairie. The East Main tram is two miles farther and extents for ten miles from north to south. This connects the Jones Grade trail to Janes. You will discover the East Main tram is sensational for both biking and hiking. You will pass right through the central slough. This is considered one of the loveliest places within the park. There are hiking maps of this area available. In excess of 85,00 acres of slow drifting fresh waters are protected by the park. This makes this Florida’s biggest strand swamp as well as a very popular attraction for native Floridians and tourists alike. This amazing park will give you the opportunity to see natural firsts many people have dreamed of. 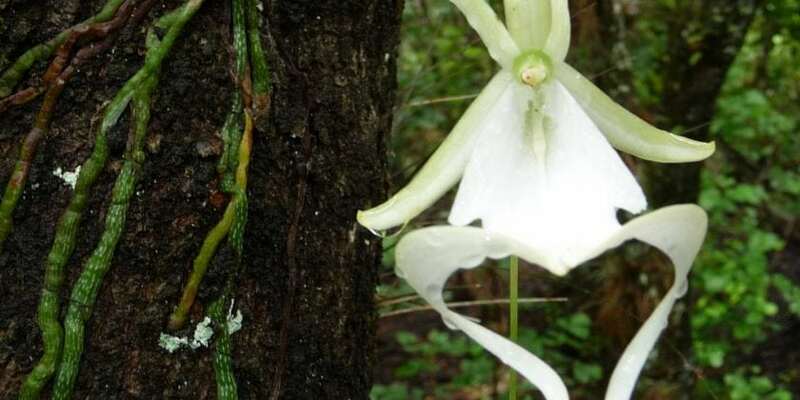 The endangered Ghost Orchid is a famous inhabitant of the park with fewer than 2,000 left in the wild. The Ghost Orchids can be viewed either on a Tram Tour or a guided Swamp Walk. Don’t try heading out on your own, it is very easy to become lost in the tangled tropical wilderness. 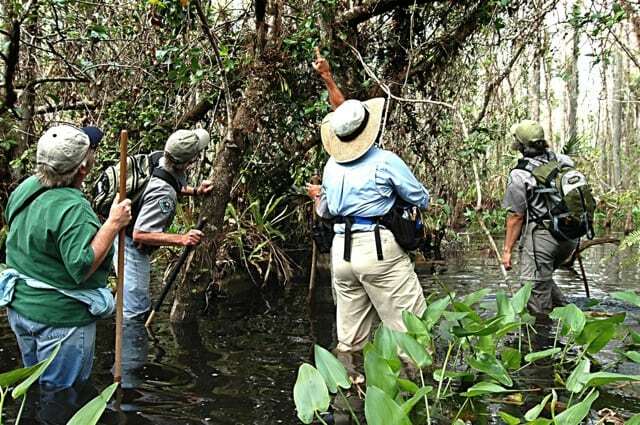 Looking for Ghost Orchids on a Swamp Walk. Photo credit orchidswamp.org. This park encompasses the second biggest tract of bald, old growth cypress. In addition, there are 44 native orchid species, 14 different species of bromeliads and 38 species of ferns. The Fakahatchee Strand Preserve State Park is the home of Florida black bears and Florida panthers although sightings of these animals are extremely rare. The trail near the Big Cypress Bend Boardwalk will enable you to see a lot of waders, vireos and warblers during migration and nesting, majestic Bald Eagles. It is important to note the condition of the eleven mile stretch of the Janes Scenic Drive is unpaved and considered to be in poor condition. You may require a 4WD vehicle to explore this area. Unfortunately, there is no camping in the area but this is still a not-to-miss day trip. For hours, fees and more information on the park, please call 239.695.4593 or visit their website at floridastateparks.org.